Filecoin, a project by Protocol Labs, is a decentralized storage network that turns cloud storage into an algorithmic market. It is powered by a blockchain and a native protocol token. Miners earn Filecoin by providing storage to clients. And clients spend Filecoin hiring Miners to store or distribute data. It Is believed that a massive amount of storage sits unused in Data Centers and hard drives around the world, they can be utilized as a source of money making. We have Storj and Sia coin based on similar concept. Filecoin shared its original white paper in July 2014, where it proposed a distributed electronic currency similar to Bitcoin. The difference between Filecoin and Bitcoin was unlike Bitcoin’s computation-only proof-of-work, Filecoin’s proof-of-work function includes a proof-of-retrievability component, which requires nodes to prove they store a particular file. Most proof-of-retrievability schemes involve two parties, a client who preprocesses data and a server who stores the processed data. At any point, the client can issue a challenge to the server, who must then calculate the corresponding proof. Usually, the challenges are generated and verified using a secret key known only to the client. The Filecoin network forms an entirely distributed file storage system, whose nodes are incentivized to store as much of the entire network’s data as they can. The currency is awarded for storing files, and is transferred in transactions, as in Bitcoin. Filecoin is re-introduced with the release of new white paper on August 04, 2017 just a month later to the release of Filecoin Research Roadmap for 2017. This new Whitepaper introduces two new Research breakthroughs in the Distributed Storage Networks (DSN) landscape: Proof-of-Replication (PoR) and Proof-of-Spacetime (PoSt). The Filecoin Token Sale was originally planned on July 27 at 7pm GMT, which then got postponed to August 7, 2017. 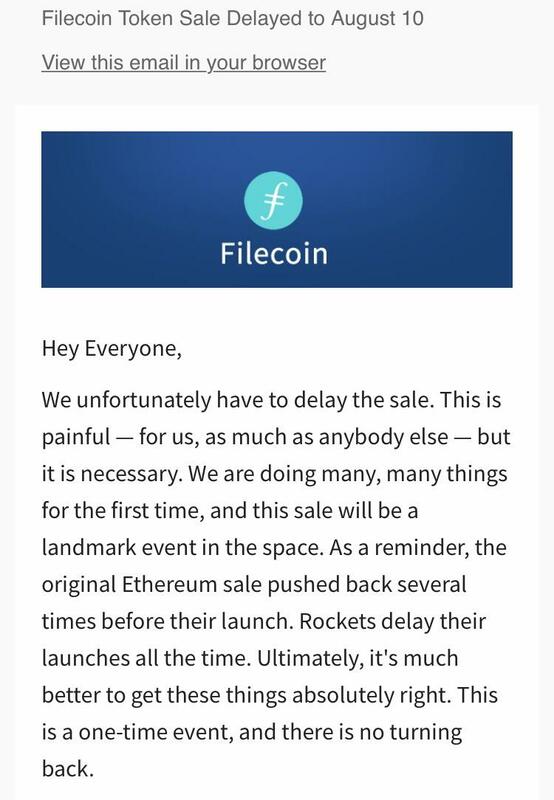 The token sale which was supposed to happen today (August 7) has been postponed one more time, now to August 10, 2017 at noon PST, announced by the Filecoin team. This announcement was made just a couple of hours before the start of the ICO. Accredited investors got the email notifying the delay. The sale will take place on CoinList which is still open for registration. It created a lot of annoyance among the investors that one who is asking for investment is unprepared for the transaction. Though, Filecoin has its own reasoning for defense. According to the tweet, "We think it's important to give people enough time to evaluate this change, and understand the details in full before deciding." Also, the time between now and Thursday could be wisely used to understand the process. After the statement of SEC on ICO or Token sale that 'The DAO were securities and therefore subject to the federal securities laws'. The Report confirms that issuers of distributed ledger or blockchain technology-based securities must register offers and sales of such securities unless a valid exemption applies. Filecoin is the first project to raise $52 million in pre-ICO after this announcement. CoinList, a United States based funding platform that connects investors to these promising early-stage token sales, is organizing Filecoin token sale. The good news here is US investors can also participate in ICO which was not allowed in man of the previous ICOs but, its still a little complicated. Income of $200k, or $300k with spouse, in each of past 2 years and expecting same or more this year. Net worth of $1M, individually or joint with spouse, excluding your primary residence. The general concept of Initial Coin Offering (ICO) or token sale is to raise money through crowd fund. An individual can participate with whatever contribution he can make and become an investor. Investor shouldn't be only the big company, rather every individual can be a bank who can lend money to a project and grow along with the project's growth. For Filecoin ICO, you can participate in the crowd sale after becoming accredited investor. The participation is restricted to an average individual by having minimum income group or net worth asset criteria. Anonymity is also not in place if asked for W2, sending verification request to your lawyer, CPA, investment adviser or broker and other related proofs. But again, the project has to meets the more stringent standard the SEC has put in place – the 506(c) standard which should work for all accredited deals, including ones that publicly discuss their financing. Anyone with query can Email filecoin-sale@protocol.ai.Team will publish new FAQs asap.